Hello I was wondering if someone would be able to identify this plant? It’s in my grandmother’s back yard in southern ontario and has been growing here for at least 25 years. It has a spotted stem and the leaves are all joined it looks very exotic. Thank you. Your grandmother’s plant is Typhonium venosum, or Sauromatum venosum, a native of Sudan, tropical Africa, the Himalayas and south India. It is sometimes known as “Voodoo Lily” (confusingly, this is also the common name for a couple of other plant species). Grown from a bulb, its inflorescence is a tall upright spike which emits a strong odour that some say is similar to cow manure or wet dog. 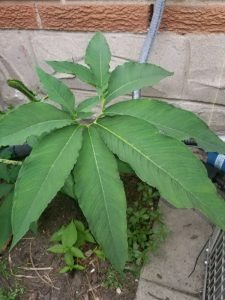 This plant overwinters well in the milder climate of southern Ontario, whereas in Toronto we are advised to plant it in a pot and dig up the bulb for indoor storage in the winter. In his blog, World Plants, Professor Michael Pascoe, the Director of the Gardens of Fanshawe College, notes that there are several notable specimens of this plant in Fanshawe’s A. M. Cuddy Gardens in nearby Strathroy, Ontario.